March 3rd was Japanese Girls' Day. Traditionally, we make Chirashi Sushi to celebrate being "girls". Tonight, Jason was working until very late, but I made Chirashi Sushi for myself anyway. I made it in my beautiful donabe rice cooker, "Kamado-san". I made the very healthy version with the brown rice, brown vinegar, and different kinds of vegetables. There were more vegetables in volume than the rice, so the dish was almost like thhe salad, yet it was still very filling and so delicious! 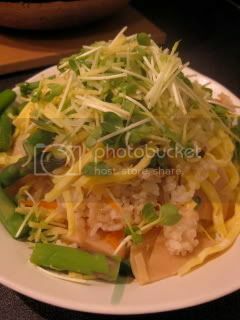 I posted the recipe in toiro's website.